The North Carolina Native Plant Society (NPS) established a Native Plant Habitat certification program to recognize those who garden with natives and to increase awareness of the benefits these plants offer. 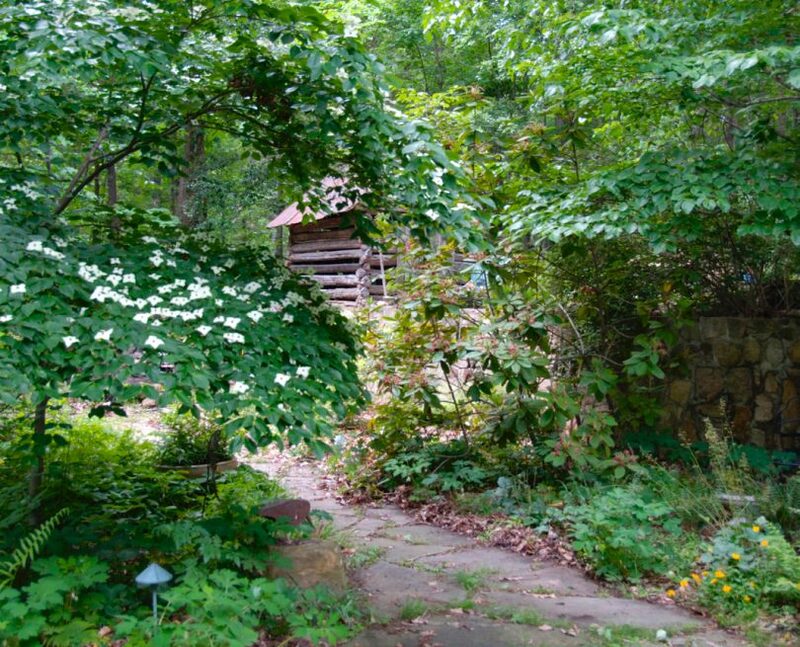 Although several school gardens, a community garden, and a conservation area are among those certified, most Native Plant Habitats, including 14 located in the Triangle, are private residential gardens. While native plant habitats have much in common—an emphasis on plants naturally occurring in our state and on conservation practices such as avoiding pesticides, reducing lawn, removing invasive plants, and composting—the reasons for creating native habitats are as variable as the gardeners and the gardens themselves. Tom Harville was enthusiastic about gardening, but had little awareness of natives when he began to landscape his home in Cary. He started with a plan by a local designer that included many non-natives such as periwinkle (Vinca minor). Harville’s desire to save money led him to transplant a patch of crested iris (Iris cristata) that he noticed growing naturally on the slope behind his house to a bed in the garden. Shortly thereafter, foamflower (Tiarella cordifolia) and liverwort (Hepatica americana) began to emerge in the plot. Harville’s desire to identify the mystery plants he had inadvertently planted led to his involvement in the Native Plant Society and many years of organizing authorized plant rescues in areas slated for development. Harville, who has served as both treasurer and president of NPS, proposed the certification program after learning about a similar effort in Georgia. No one in Cheryl Prather’s family gardened. According to Jeff Prather, Cheryl’s mother cleaned her daughter’s sneakers with a toothbrush if she ventured outside. Eager to develop a sense of place after 20 years of moving with Jeff’s military career, Cheryl embraced gardening as a means to that end. The landscape architect who laid out a long-range garden plan for the Prather’s encouraged Cheryl to volunteer in order to learn about gardening. 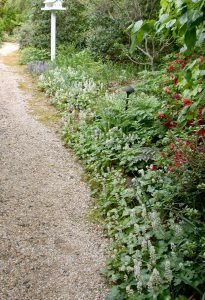 That advice led Cheryl to the Blomquist Garden of Native Plants at her alma mater Duke University. Weeding at the Blomquist Garden helped Cheryl learn to identify plants such as the lone Christmas fern (Polystichum acrostichoides) she found growing in what became her backyard. Nearly 20 years later, Cheryl continues to volunteer and to learn from the professionals at Duke Gardens. Over the years of volunteering, she has learned which plants she doesn’t like and which ones she “really likes.” Most importantly she has learned how to match plants with their ideal growing conditions. Curiosity about her historic home’s original owner started Carolyn Ikenberry down the path to native gardening. Writer Paul Green built the Chapel Hill home in the 1920’s. Most famous for his outdoor drama, The Lost Colony, Green also wrote about his childhood in rural Harnett County. Reading Paul Green’s Plant Book: An Alphabet of Flowers and Folklore prompted Ikenberry to learn more about native plants through local resources like the North Carolina Botanical Garden. 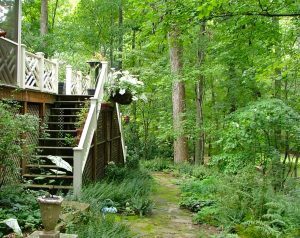 She and her husband spent many years removing the Chinese wisteria and bamboo that had overtaken most of the property and Green’s original garden. Gardening in earnest since her retirement ten years ago, Ikenberry also serves as coordinator for the Native Plant Society’s Habitat Certification Program. Although these native plant habitat gardeners’ interests vary widely, they all say their greatest satisfaction comes not from the plants, but from the diverse community of wildlife from butterflies and box turtles to owls who share, enliven and depend on their gardens.